The Money On My Mind singer has posed for the 20th annual edition of OUT magazine. Orange Is The New Black star Samira Wiley, Canadian star Ellen Page and Star Trek Into Darkness actor Zachary Quinto also grace separate covers. 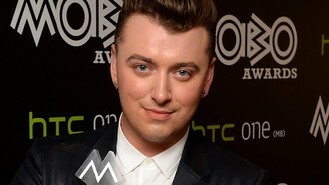 Sam told the magazine, which named the singer the Breakout Of The Year, that he wanted to make coming out as gay an easy experience for others. "My aim is to tell people how good it's been for me so that, hopefully, gay men or parents with gay children can look at my story and think, Wow, that's how it should be," he said. "That's what we can work towards. That's been my whole motive - to not make it a talking point. My music should be a talking point. My voice should be a talking point." Sam said he had expected record label bosses to be more controlling. "I say what I think, act how I want to act, post what I want to post," he said. "There's no one telling me to do this, lose weight, look like this, sing like this, write songs like that. I've just been allowed to be me, and from all the nightmares you hear about the industry from a young age, I never thought that would be the case."